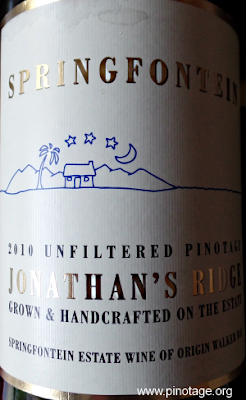 WotM - Springfontein Jonathan’s Ridge Pinotage 2010. 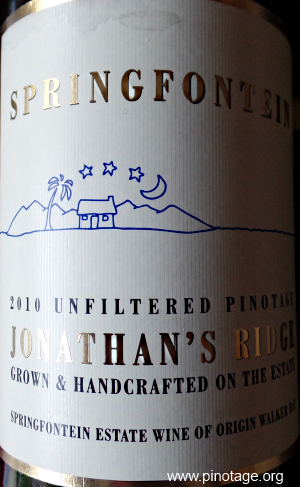 My Wine of the Month for September is Springfontein ‘Jonathan’s Ridge’ Pinotage 2010. This wine has depth with lush sweet fruit backed by lovely soft tannins from its 19 months aging in 80% new French and American barriques. It’s not until later processing the label photo I noticed 15% abv, the wine is just so well balanced and drinkable and it was deservedly a Top 10 winner in 2013. It’s a single vineyard wine from vines planted in 2000, so less than 9 years old at time of harvest. Wild yeast fermented and unfiltered. The label is informative, and is hand numbered. This was No. 2290 of 3839. Springfontein is in the upcoming Stanford area. I’ve not yet visited this winery or the others nearby except for Raka. I must do so, for I have enjoyed several bottles of Jonathan’s Ridge since first being recommended it at the wine shop in Hoek Hoew farmshop. Dr. Johst Weber bought the Walker Bay property in 1994 and decided the terroir best suited Chenin Blanc and Pinotage. The current winemaker is Tariro Masayiti, but the 2010 vintage was made by Christo Verfeldand. 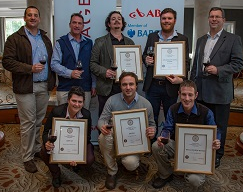 International Wine & Spirit Competition for 2015 sees awards for 60 varietal Pinotage’s. The majority are red but there’s also some rosés and one from the ‘coffee’ category. There’s one ‘Gold’; Kanonkop Pinotage 2012, 16 ‘Silver Outstanding’, 23 ‘Silver’ and 17 ‘Bronze’. At least four Cape Blends won awards: 1 ‘Silver Outstanding’ (Flagstone Dragon Tree Cabernet Sauvignon Shiraz Pinotage 2013), 2 ‘Silver’ and 1‘Bronze’. Not all are shown as Cape Bends or with a Pinotage component. One of the 60 Pinotages is not from South Africa. Step forward and take a bow the Martiniuk family who own, farm and make Stoneboat wines in British Columbia’s Okanagen Valley, including their delicious Pinotages from vines growing ungrafted on their own roots. See here for more info. IWSC judging awards gold, silver and bronze in each tasting category or flight, provided the required minimum score is reached. On the 100 point tasting scale Gold = 90-100, Silver Outstanding = 86-90, Silver = 80- 85, Bronze = 75=79.9. Products with the highest mark in their respective category are awarded “Outstanding” and are re-tasted for national and international trophies. Beyers Truter, chairman of the SA Pinotage Association who organises the Perold Cape Blend Competition in collaboration with Absa, says the Cape Blend is one of the country's most dynamic and exciting wine categories. According to Craig Bond, Chief Executive of Retail and Business Banking at Barclays Africa, Pinotage and the Cape Blend category of wines are truly unique jewels in the crown of the South African wine industry. “This partnership reflects our long-standing commitment not only to the Pinotage Association, but to the South African wine industry as a whole. Our purpose of helping people achieve their ambitions is centred around innovation and creativity. The Cape Blend winemakers reflect these values with their dynamic and passionate search for wines that have an individual identity. These blends are creatively put together and reflect the best of South African inspiration,” says Bond. “Our continued involvement with this competition is inspired by our confidence in the new generation of South African winemakers who are working hard to increase the prestige and sophistication of wines produced in South Africa,” added Bond. According to the rules of the competition, at least 30% of the final blend – but not more than 70% – has to be Pinotage. A category rapidly growing in popularity, this year’s competition attracted 56 entries from some of the country's leading wine producers. The 2015 race was so closely contested in fact, that 11 finalists were selected instead of the customary 10. The judges for this year's competition were Neil Ellis (convenor), Kevin Arnold, Andre van Rensburg, Karl Lambour, Christine Rudman and Samantha de Morne-Hughes (associate). Kaapzicht and Painted Wolf both were winners last year and KWV a finalist. Interesting to see Namaqua’s entry is the only one of the ten whose blend (min 30%, max 70% Pinotage) doesn’t contain either (or both) Cabernet or Shiraz. Cabernet Sauvignon partners 8 times, Shiraz and Merlot each 5 times, Malbec 3 times, twice for Petit Verdot and once for Cabernet Franc, Cinsaut, Grenache, Mourvedre, and Viognier. Congratulations and best wishes to all . The five winners will be announced on 10 September.